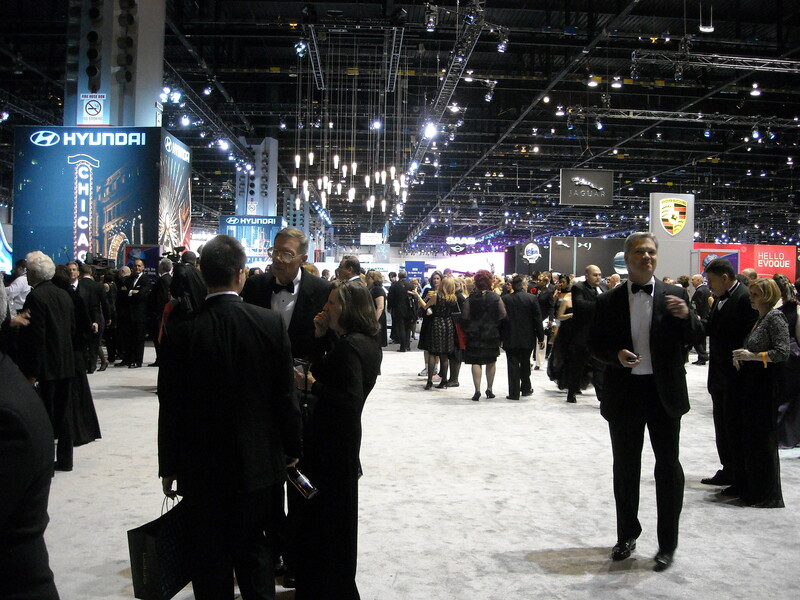 This past Thursday, February 10 2011, I had the honor of joining my friends from Univision Chicago and attending the First Look for Charity benefit at the Chicago Auto Show. This exclusive event is held the evening prior to the auto show opening and offers a premier viewing of all of the exhibits. Attendees danced to the beats of KC and the Sunshine Band, dined on elegant hors’ devours and libations from local establishments, and mingled while checking out all of the new vehicles. This year’s event raised almost $2 million dollars– $1,905,060 to be exact, which benefits eighteen area charities. Individuals can choose a specific charity to sponsor or elect to have the proceeds equally benefit all of the participating charities. Kevin Mize, owner of O’Hare Honda and O’Hare Hyundai, Board member of the CATA (Chicago Automobile Trade Association), and Chairman of this year’s show, stated, “All of the benefitting charities are involved locally, so the money that’s raised in Chicago stays in Chicago.” The black-tie benefit has been in existence over 20 years, and since it’s inception has raised over $30 million dollars. The First Look for Charity is also a way for the Chicagoland new car dealers to showcase their positive impact on the community, and this year was no different. One of the highlights of the evening was the drawing for the (2) grand prize vehicles– a 2011 Honda CR-Z, compliments of American Honda Motor Company, and a 2011 Hyundai Sonata Turbo, compliments of the Chicagoland and Northwest Indiana Hyundai Dealers. Benefitting charities included: Autism Speaks, Boys & Girls Clubs of Chicago, Catholic Charities of the Archdiocese of Chicago, Catholic Charities- Diocese of Joliet, Children’s Memorial Hospital, The Cradle Foundation, Cystic Fibrosis Foundation, Evans Scholars Foundation, Franciscan Community Benefit Services, Ray Graham Association for People with Disabilities, March of Dimes Foundation, Misericordia Heart of Mercy, Respiratory Health Association of Metropolitan Chicago, Special Olympics Illinois, Spina Bifida Association of Illinois, St. Coletta’s of Illinois Foundation, St. James Hospital & Health Centers, Jesse White Tumbling Team.